were presented by Ginny Cannon. From the Sunrise club (soon to be from our club) Doug Roberts, also from the Sunrise club John Jones. 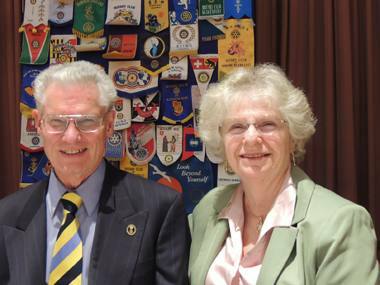 From the Marin Evening Club Holly Axtell (past District Governor) and Keith Axtell (program for the day). Rich de Lambert introduced Dave Gardner, Diane Moresi introduced Gordon Dow, Eileen Carlisle welcomed past member Sandy Handly, Cecil Humes introduced Emily Harrington and Casey D ‘Angelo welcomed his guest Lisa Katingburg. According to Penny Tibbetts all is sunny in Rotary land! What is the message to all Rotarians from RI President Ron Burton from the March 2014 issue of The Rotarian? Bart Eddy is in process in the classification of Publishing. He is being sponsored by Karen Ball. Craig Meltzner announced the $130 was in the pot today and John Poremba had the lucky ticket but failed to pull the Queen of Diamonds and settled for the $10 consolation prize. Next week’s meeting will be at St Rose. 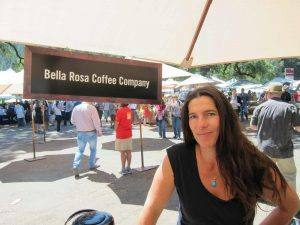 Peggy announced that thanks to the Giro Bello Committee marketing, with kudos especially to Gesine Franchetti for the fantastic promotion from her new Rosso Rusticceria & Eventi, we currently have 260 riders registered for Giro Bello. We also received a push from Windsor Bikes. It took us until June 1st last year to reach the same number of riders! Keep up the good work, everyone! Only two months to go before the fourth annual “Beautiful Ride” kicks off from the O’Reilly Media campus in Sebastopol on June 28th. We ask our club members to continue to spread the word about Sonoma County’s finest cycling event and to volunteer to help. If you haven’t worked this event in the past, we highly encourage your participation if for no other reason than it’s A LOT OF FUN! Our goal is 1,000 riders this year and we can use your help! 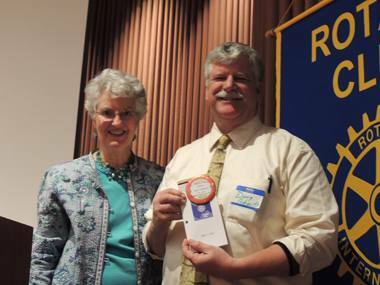 President Peggy welcomed Doug Roberts to the stage and presented him with his red badge as our newest member. 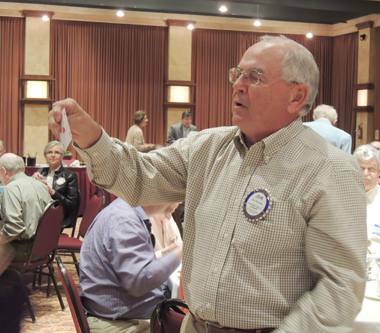 Doug is already a Rotarian so he is primed and ready to make an impact with our club. Ryan Thomas read a touching and amusing letter from a student at Procter Terrace School thanking us for her new dictionary. Yale Abrams announced 2 upcoming “hands on” projects on April 12 and April 26. Signup sheets will be on the back table for the next few weeks. Elizabeth Karbousky asked the March birthday boys and girls to come on up. They included Rick Allen, Debra Dorfman, Robby Fouts, Schuyler Jefferies, Jock McNeil, Larry Miyano, Mark Burchill, Eileen Carlisle and Jane Duggan. The birthday group was serenaded to a chorus of “Happy Birthday” by their fellow Rotarians and the lucky ticket holders won a piece of Pie in recognition of Pi Day! Kathleen Archer was in Washington DC and ran into a snow storm and was pictured making snow angels on the ground. She donated $100 to the Christopher Wood scholarship fund. Ray Dorfman donated $50 to the Jack Levar fund for his recent trip though the Caribbean floating his way through the islands while enjoying eating and drinking and eating and drinking! 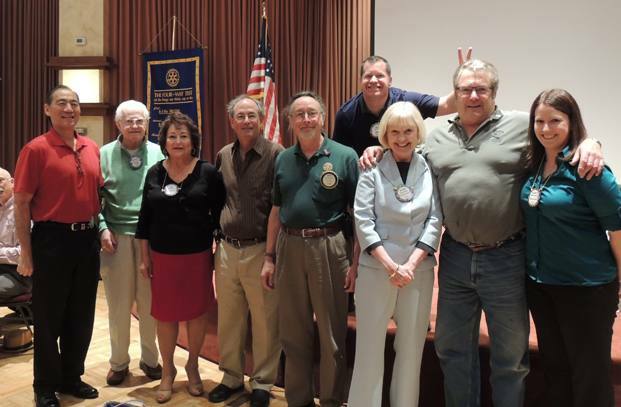 Rich de Lambert was recognized for his part in presiding over the club as president when our club became the first Rotary Club in California to accept women as members. Rich tried to fudge out of a fine by saying what a terrific job Peggy is doing as president but she wasn’t moved by the compliment and Rich upped $25 to the club. Paul Hamilton shared his pride for his granddaughter and grandson for their accomplishments at a recent cheer competition at Disneyland where his granddaughter’s team captured 2nd place and his grandson’s success at the plate at the opening of the Petaluma little league season. Paul pledged $50 toward a Paul Harris for each of them. Keven Brown back from a short trip to Paris to see his brother perform donated $100 to the local foundation. Nicole Le announced that their 17 month old daughter has been going through a series of tests due to seizures and happily shared that she is okay and in good health. She and the family are off to Hawaii on Friday to celebrate and donated $50 the Wood scholarship fund. 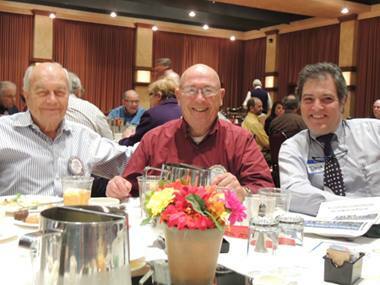 Tim Delaney introduced our program, “Micro Credit loans” presented by Marin Rotarians Keith Axtell and Holly Axtell. Tim gave a brief accounting for the donations that our club has made over the past year as part of our World Community Service program which includes this program. Around 8 years ago District Governor Holly Axtell was looking for a project that would make an impact and improve the quality of life of others. In part because of the extreme poverty that people in Ecuador and Columbia live in, “micro” loans to people that would like to be more self sufficient are very effective. These loans range from $50 to $300. The story of how one woman borrowed $100 to purchase a cow and from that cow was able to produce milk to nourish her family and from the manure she grew fruits and vegetables for her family and to sell. A new project in Esmeraldas (the poorest Province in Ecuador) has just been approved by the Rotary International Foundation and is making $187,000 available for loans. These loans will provide training for such things a Business Administration, Marketing and Commerce, Dress Making, Baking, and Plumbing. According to the Axtell’s, almost all the loans are paid back in full. Currently there are 6 matching grant projects, 1 Global Grant project and in total $360,000 has been loaned out over the life of the program. A Question and Answer session followed the session which included an interesting reason why most of the loans are given to women rather the men and the high interest rate of the loans (over 22%). The answer to the man vs. women questions had to do with the risk that women would use the loans for their family’s welfare and the men might take their buddies out for a good time. The high interest rate is due to the fact that these people are unable to get traditional bank loans and have no credit history. Drowning me like an ocean wave. Has made me very sad. Will tell you I am there. will banish my endless pain. And for me, please do not cry”. My heart and soul now go.